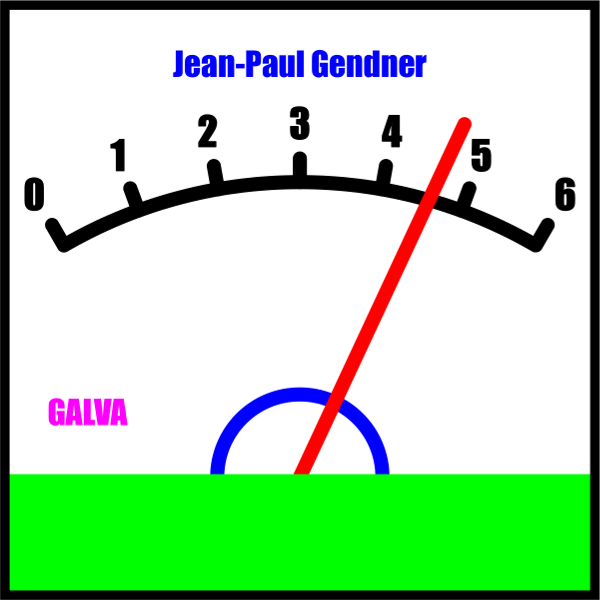 New sample files Galva_Arc_*.Dat, Galva_Droite.dat and Galva_DroiteV.dat (and a tutorial in English and French downloadable in the « Articles » Tab) to facilitate the realization of all types of galvanometer dials. New GCE_Texte external command which replaces the command GCE_Crenage, allowing to modify the spacing between the characters of a text and allowing in addition any rotation of the text. New GCE_TexteV external command allowing to modify the vertical spacing between the characters of a vertical text. 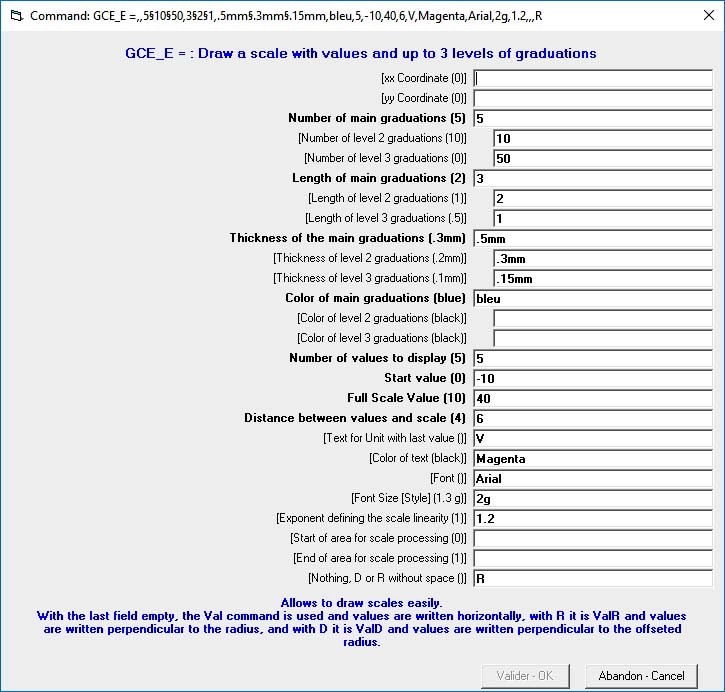 The Decal command now accepts positive and negative offset values for the arc axis relative to the galvanometer axis. This allows its use for scales below the axis of the galvanometer (see types of dials 7, 8 and 9 of the tutorial for the realization of any galvanometer dial). 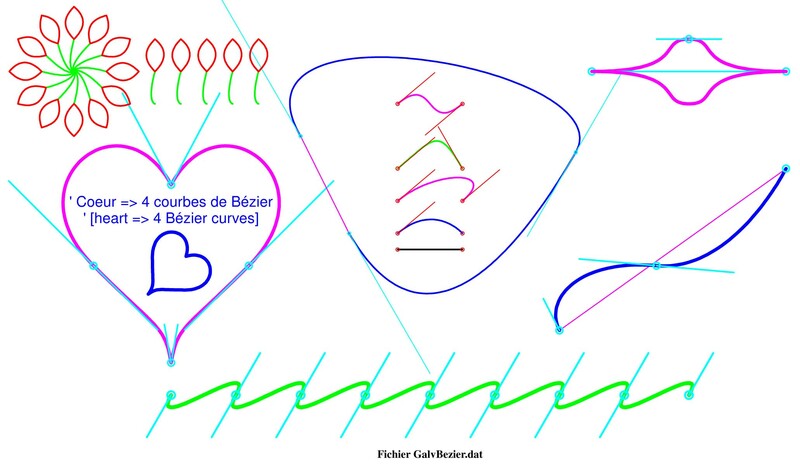 New Bezier_aGr command that draws n graduations on a Bezier curve or graduations according to a list of percentages or angles in °. The main novelty of this version is the ability to insert Bézier curves. The version 2.61 adds the ability to use scaling factors and offsets in X and Y and to rotate the curve. The 2.61c corrects small errors. The other major novelty of this release is the ability to insert drawings drawn with the mouse, continuously or point-to-point. New RefCur command, the last one of the program, defines the coordinates of references for the display of the coordinates of the mouse and for the coordinates used for the Drawings. Fixed the Plot command and its input mask, enhancement, adaptation to display Drawings entered with the mouse and new possibility of rotation. A double click in the mouse’s polar coordinate display toggles between displaying Trigonometric coordinates and coordinates for the « Arc » command. 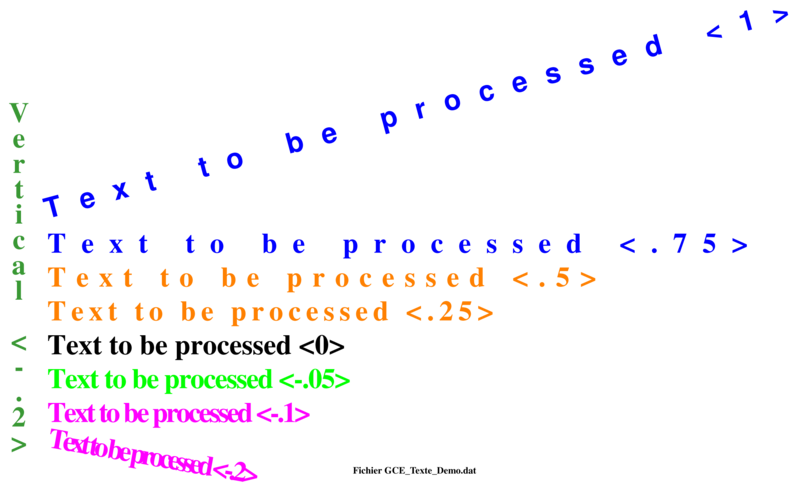 Alt-F2 displays the syntax of the line on which the mouse is located. New external commands GCE_Chain0 and GCE_Chain1 calculating the parameters and displaying chains or suspended wire that can follow one another, without or with load. New GCE_Grille external command that allows to draw different kinds of grids. New GCE_Self external command that allows to draw solenoids. The main novelty of this version is the ability to use input masks (in French, English and German) for all commands. This greatly facilitates the input of commands, and obviously especially of those with a large number of parameters. Another important novelty is the ability to use If[T] multi-line commands, that is, starting with an If[T] command and necessarily ending with An EndIf command. Between these two lines one can place command lines, and if necessary ElseIf[T] commands and one Else command. Operators And, Or, Xor (Exclusive Or) and Not may now be used in logical expressions. Another important new feature of this release is the ability to use external commands or macro-commands, which can be added without changing the Galva program code. The purpose of these external commands is to facilitate specific tasks. ANY INDUSTRIAL, COMMERCIAL OR BUSINESS USE OF THIS SOFTWARE IS STRICTLY FORBIDEN WITHOUT PRIOR WRITTEN PERMISSION FROM THE AUTHOR. For other uses, it is a « PostcardWare » license. In short: to be allowed to use Galva, just « simply » send a postcard to the author. About that, read « Conditions of Use » in the Help. For the installation or the update of the program, it is recommended to read the file A_Lire-Read_Me.pdf contained in the installation zip file.